Welcome to the Cottages of Camp Creek vacation rentals! 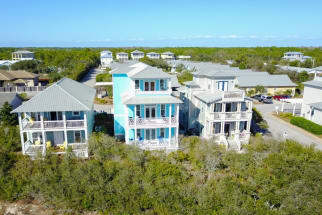 These beautiful Key-West style beach cottages are located north of 30A in Seacrest. This private community provides cottages with metal roofs, covered porches and a very large community pool and hot tub. This is one of the most complete beach communities in the area. There is several unique stores, boutiques and acclaimed restaurants in the surrounding area. Some of the favorite restaurants include Restaurant Paradis, Caliza Restaurant and La Cocina Mexican Grill and Bar. The area offers several activities such as deep sea fishing, kayak rentals, and golfing. The Cottages of Camp Creek is a great place to spend a family vacation! Book your trip to the Cottages of Camp Creek with Emerald Coast By Owner. Please contact one of our property owners directly and they will help you plan your next Emerald Coast vacation. Simply click on the "Email Owner" button found on each listing to send a property owner a message directly. Booking direct with the property owner assures that you are not over paying for your rental. ECBYO does not charge any service fees when you book with us! We hope you enjoy your stay on the white sandy beaches at the Cottages of Camp Creek!